A lovely, upscale cottage in the tall pines. Western Pines Cottage is located west of Prescott just 3.7 miles or 9 minutes from the downtown Courthouse Plaza. 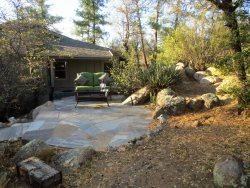 This hidden treasure is nestled amongst tall pines and large boulders and offers privacy and tranquil relaxation. Western Pines Cottage is a two bedroom and one bath property that sleeps four guests. The master bedroom has a king bed with deck access through a slider right onto a dreamy outdoor space with table and chairs for dining and visiting. A propane grill is set up for your meats and veggies as you gaze at the beautiful sunsets this cottage affords. Up a few steps… you will find an upper seating area with loveseat and coffee table. Are you not satisfied with those two choices? Just walk around the wrap-around deck and enjoy the rocker/swivel chairs on the front porch. The queen bedroom is decorated with lovely horse portraits and is opposite of the jack & jill bathroom. This property has been up-graded in every detail. Marble countertops, gleaming wood floors, knotty pine interior and new windows. The bathroom has a double vanity and deluxe walk-in shower. Skylights are everywhere in this well-lit space and you needn't turn on lights during the day. Natural daylight floods the cottage and accents all of the wonderful features of this home. The living room has a loveseat and two reclining chairs to gaze at the fireplace or watch your favorite show on the Cable TV flat screen. Many Olaf Wieghorst prints adorn the walls giving this space a "cowboy" feel of Prescott's natural heritage. This Western Artist is known for his magnificent portrayals of the nineteenth century American West. High speed wireless Internet keeps you in touch with your friends and family as you dream the days away on your Prescott vacation. The modern kitchen is fully stocked with all pots, pans and dishware. For simple snacks or gourmet meals you will find everything you need in this comfy confine. A dishwasher makes clean-up a breeze and the washer/dryer makes longer stays more convenient. Central A/C and Heat keeps away the summer heat and chill of winter. Although, with four mild seasons often barely used. There are 12 steps along a winding path to get you inside from the parking lot. Simply perfect for keeping you in shape as you carry your things to and fro. Whether it’s a weekend get-away or extended vacation Western Pines Cottage is your home away from home for as long as you like!